Marco Tabilio’s gorgeous graphic novel Marco Polo vividly relates the story of the famed explorer. This graphic biography encompasses Polo’s whole life, showing not just his time in the court of Kublai Khan but also the influences of his family on his chosen path as a traveling merchant. It sheds light on the lesser-known events of his later days as well, including time spent as a captain in the Venetian fleet and, following the defeat of those forces, his time spent in jail. It is. As portrayed through Tabilio’s hand, Marco Polo is a vividly rendered, humanized figure, full of doubts and fears, loves and aspirations. Tabilio’s art is highly stylized. Characters have blank eyes reminiscent of Little Orphan Annie; most pages are colored in monochrome, with different hues used to indicate different locations or time periods; and there are several elaborate, hand-drawn maps. Yet the storytelling is always clear, and the tale itself is grounded in Polo’s actual accounts. 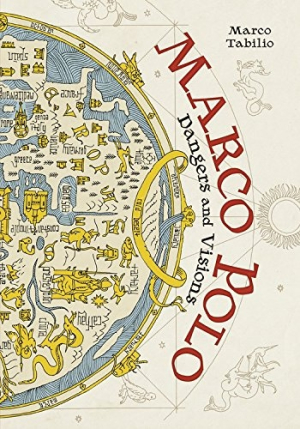 Marco Polo: Dangers and Visions captures the excitement and spirit of exploration that have kept Polo’s name and stories relevant, even as the world seems to get smaller.